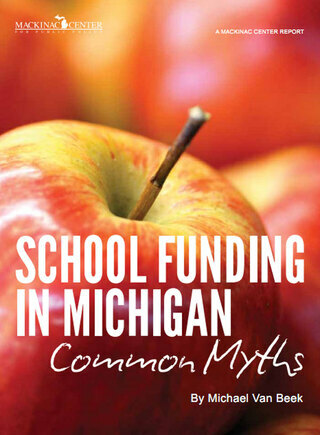 In addition to demanding “adequate” and “stable” funding, the special interest groups embedded within Michigan’s public school system frequently call for funding that is “equitable.” They overlook the fact, however, that greatly reducing funding disparities was one of the goals — and accomplishments — of the 1994 Proposal A school finance reform. While achieving perfect equality is a greater challenge than most imagine, today the spending differences between schools is smaller than ever before. Before Proposal A, 80 percent of Michigan school operating funds came from local property taxes. Because both property values and voter-approved millage rates varied widely between districts, the system produced large funding disparities. Prop A cut and capped millage rates, and made up the forgone revenue with an array of earmarks from state income taxes, sales taxes, a 6-mill state education property tax and others. These sources provide an annual infusion of some $11 billion in state money that is distributed to public school districts according to a “foundation allowance” formula, which establishes a minimum amount of dollars per student that each district gets to spend. This minimum represented a substantial increase over the revenues of the state’s poorest districts at the time, and over what those revenues most likely would be today were we still under the old system. The new system, however, did not absolutely level revenue among districts, and arguably never intended to. Its distribution formula is based in part on districts’ pre-Proposal A funding levels, so that the most richly funded schools were not forced to come down. In other words, disparities would be reduced not by pulling down the well-funded districts, but by bringing up those below them. In simple terms, the Proposal A distribution formula factors in revenue from (capped) local millages levied on non-residential property, supplementing this with varying levels of state tax revenue. Therefore, funding disparities still exist. For instance, the per-pupil foundation allowance in the Bloomfield Hills district is more than $12,000, while the effective minimum amount for some districts is about $7,100. This particular eyebrow-raising $5,000 disparity is abnormal and is the most extreme case; under the previous system the gap between highest and lowest was more than $7,500. But the vast majority of schools now are funded at levels that fall in a fairly narrow range. The House Fiscal Agency reports that in the 2009-2010 school year, 80 percent of all districts (including charter public schools) receive between $7,100 and $7,400 per student through the foundation allowance formula; 94 percent fall between $7,100 and $8,500. Only 5.5 percent of districts exceed $8,300 in per student spending under the formula. And like Bloomfield Hills, the other big spenders generally get less state money, relying on local property taxes to maintain their comparatively high revenues. The foundation allowance is only one school revenue source, however, and money from other sources further reduces disparities. 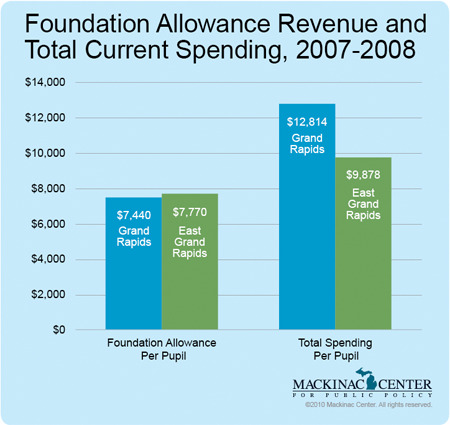 For example, the foundation allowance for Grand Rapids schools is around $300 less per student than the neighboring district of East Grand Rapids, but the Grand Rapids district receives much larger amounts of federal and state “categorical funding” that is allocated in large part on the basis of having a greater number of students from low-income households. In 2007-2008, Grand Rapids schools spent $3,000 more per pupil on operations than its wealthier neighbor — a disparity would-be “levelers” unlikely want to reverse. Michigan policymakers and voters wisely decided in 1994 that the proper goal in a system of government-run public schools is not “leveling” to achieve perfect funding equality, but instead to ensure that every community’s schools have a reasonable amount of money to educate its students. As mentioned, the system created then did not attempt to tear down the high spenders, but instead raise up lower-funded ones. There is in fact a means to provide equal funding for all students no matter where they live — it’s called school vouchers. Interestingly, those who complain the most about “inequitable funding” — like representatives of school employee unions and school boards — are also the loudest opponents of eliminating inequity by giving parents the choice of where to school their children. Joe Carrasco and Kathryn Summers-Coty, “K-12: A Moving Target” (Michigan Senate Fiscal Agency, 2002), 1, http://www.senate.michigan.gov/ sfa/publications/notes/2002notes/notesjulaug02carrascosummers.pdf (accessed October 12, 2010). “Effective Foundation Allowance Changes since Proposal A, Fiscal Years 1993-94 through 2009-10” (Michigan Senate Fiscal Agency, http://www.senate.michigan.gov/sfa/Departments/DataCharts/ DCk12_BasicFoundationHistory.pdf (accessed October 6, 2010). Kathryn Summers-Coty, “School Aid Funding Formula: Further Closing of the School Aid Equity Gap” (Michigan Senate Fiscal Agency, 2007), 1, http://www.senate.michigan.gov/sfa/publications/notes/2007notes/ notesnovdec07ksc.pdf (accessed October 13, 2010). Mary Ann Cleary and Bethany Wicksall, “School Aid” (Michigan House Fiscal Agency, 2010), 32, http://www.house.mi.gov/hfa/briefings/ School%20Aid%202009-10%20final.pdf (accessed October 7, 2010). 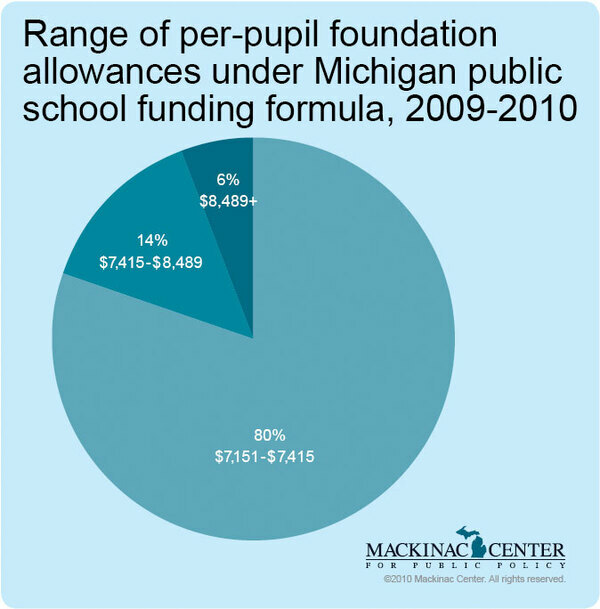 A breakdown of the foundation allowance formula for each school district is available through the Michigan Department of Education at http://mdoe.state.mi.us/statusreports/. “Per Pupil Statutory Funding History for Schools, FYs 1993-94, 1994-95, and 1999-2000 to 2009-10” (Michigan Senate Fiscal Agency, 2010), 14, http://www.senate.michigan.gov/sfa/Departments/DataCharts/ DCk12_FoundationHistorySincePropA.pdf (accessed October 13, 2010). “Michigan School District Revenue and Expenditure Report” (Mackinac Center for Public Policy), http://www.mackinac.org/depts/epi/fiscal.aspx (accessed October 6, 2010).